The battle of Rietfontein took place on 24 October 1899 between the six commandos of the Free State Army commanded by Mr A P Cronje and a Flying Column dispatched from Ladysmith under the command of Sir George White. Harrismith (C J de Villiers), Kroonstad (C Nel), Winberg (M Prinsloo), Bethlehem (H Naude), Vrede (A Lombard) and Heilbron (under Steenkamp). According to General C de Wet (1903, p10), who was present at the battle, the Boers numbered not more than one thousand. The Colonial Contingent consisted of the Natal Carbineers (NC) under Lt-Col E M Greene, the Border Mounted Rifles (BMR) under Maj J F Rethman, the Natal Mounted Rifles (NMR) under Maj R W Evans, the Natal Police Field Force (NPFF) and the Natal Volunteer Medical Corps under Maj J Hyslop (Stirling, 1907, pp27-8). The Imperial Light Horse (ILH) was led by Maj Karrie-Davies. The cavalry was commanded by Maj-Gen J French, the colonial troops by Colonel W Royston, the artillery by Colonel Downing and the infantry by Colonel I S M Hamilton, who was suffering from a bad cold picked up in the rain at the battle of Elandslaagte three days before. Sir George White and his HQ Staff seem to have positioned themselves amongst the artillery. Finally, it seems that the Regimental Baggage, the Supply Column and the second half of the 2nd Bn King’s Royal Rifle Corps neither left Ladysmith nor took any part in the battle. Reveille was at 04.00, but no doubt many soldiers were up before then. The column ‘assembled [three] miles [4,8km] out’, according to Douglas Haig, on the Newcastle road. A number of witnesses testify that the day dawned ‘blood red’ (Scott, 2006, p130). used by the Boer forces as their main field hospital, c 1902 The hamlet of Rietfontein lies approximately six miles (9,6 km) north of Ladysmith in KwaZulu-Natal, between the fork in the Newcastle and De Beers Pass roads. In 1899, the farm consisted of a small, modern, three-bedroomed bungalow, built by the then recently departed Mr Walter Pepworth and his faithful partner, Frank Reid, in 1893. There were a number of other buildings on the site, including a ‘Voortrekker cottage’ built in the 1840s, a fortified kitchen from the 1870s and accommodation for visitors. Before the construction of the Natal Government Railway (NGR) line in 1887, Rietfontein stood abreast of the main Ladysmith to Newcastle road. After the railway was built, the main road shifted about a mile to the east, making the farmhouse something of a backwater. 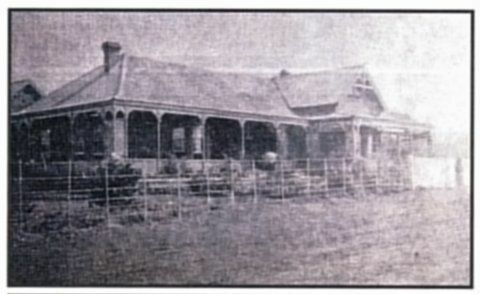 Through Pepworth’s influence as a member of the Legislative Council (MLC), the NGR built a railway station on the farm and named it Modderspruit. During the occupation in 1899, the Boers used this station as their main terminal for bringing in men, ammunition, fodder, food and medical supplies. Three miles (4,8 km) north of the fork and running from east to west are two features known as Nodashwana, sometimes referred to as ‘Swaatbouys Kop’ (4 300 ft [1 310m) above sea level) to the left and Intintanyoni (3 900 ft [1 188m] above sea level) to the right. Beyond them and running parallel to the Newcastle road are a series of hills culminating in Jononos Kop (see Map 1). The strategic considerations leading up to the battle of Rietfontein are well documented and will not be repeated in detail here. In brief, it was the third in a series of battles fought during the last ten days of October 1899, which culminated with the Siege of Ladysmith. The first of these battles had been fought at Talana (Dundee) on 20 October between the Dundee Garrison, commanded by the British General Penn-Symons, and the Transvaal burgher forces under General Lucas Meyer. It had resulted in the death of the British general and the retirement of his column of about 4 000 men, under his successor, General Yule, to Ladysmith via Van Tonder’s Pass. About 850 Transvaal burghers, commanded by General Kock, had then effectively seized the little railway station at Elandslaagte, ten miles (1,6km) north of Rietfontein, presenting a direct threat to General Yule’s retiring force. As a precaution, General White had dispatched a contingent of around 3 500 men of the Ladysmith Garrison under the command of Sir John French, who had managed to rout the Boers, thus allowing General Yule to continue his retirement to Ladysmith. 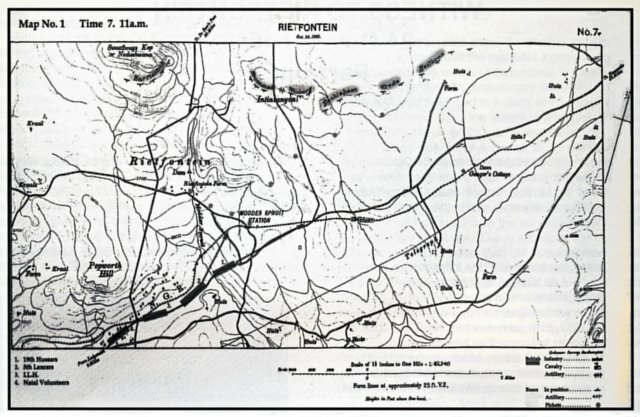 Early on the morning of 23 October, reports began to arrive at Sir George’s headquarters that units of the Free State forces, previously thought to have been in the region of Bester’s Station, had taken up positions on and around Rietfontein farm, not only posing a threat to the Newcastle road and the railway that ran parallel to it, but also to General Yule’s right flank. The Boer dispositions were as follows: The Harrismith Commando was at the base of Nodashwana with the Kroonstad Commando on the smaller of the two hills making up Intintanyoni and the Winburgers on the higher hill. The Bethlehem, Vrede, and Heilbron commandos were disposed, in that order, parallel to the Newcastle road and NGR line on the line of hills to Jononos Kop. There has been much debate about the number of Boer artillery pieces present, which varies from one to six, depending on sources. De Wet (1903, p10) states that ‘our only gun was placed on the side of a high koppie on our western wing’, ie between the Kroonstad and Winburg commandos. Breytenbach (Volume I, p290) supports this, stating that it was a Krupp gun and therefore a 75mm (Black and White Budget). Leo Amery (ed), The Times History of the War in South Africa, Volume II, p204, provides a good idea of how the cavalry were deployed ahead of and to the sides of the column at Rietfontein: ‘Both the British flanks were protected by mounted troops. The Imperial Light Horse, 5th Lancers and 19th Hussars were on the right, while the Natal Carbineers, Border Mounted Rifles, Natal Police and the Natal Mounted Rifles were called back to take up position on the left’. Major Herbert Watkins-Pitchford, Permanent Veterinary Officer (PVO), describes the beginning of the action when he records (1964, p4) that, ‘[a]bout eight miles [12,8km] out of town, as we were cantering along watching the Lancers work over the ground like pointer dogs searching all over, the faint crack of a rifle away upon our left front showed that the game had finished. This was the first shot of the battle. I looked at my watch and saw it was eleven minutes past seven’. Although the arrowhead formation of the cavalry described above by Amery may have been fine in theory, it would, in practice, due largely to the proximity of the railway line on the left flank, have been reduced to single file by the time the leading elements reached Modderspruit Station, with the Imperial units to the fore and the Colonial units just behind. According to Breytenbach (Volume I, p 291), the 19th Hussars came under fire first: ‘Everything proceeded well until around 7am when the Free State piquets on the ridge and hillocks in front of Intintanyoni [sic] discovered the advancing British riders which consisted of troops from the 19th Hussars. They were approaching Modderspruit Station at a distance of 1 000 to 1 200 yards (steps) [about 1 000 metres]. The guards started firing at them with their Mausers, causing the Hussars to retreat. They were, however, quickly reinforced by the 5th Lancers’ (see Map 2). Most commentators agree that the Boers had thrown out a piquet line in front of their defensive position. At 1 000 to 1 200 yards, this places some Boers in and around Modderspruit Station. The 19th Hussars, however, retreated forward in the direction of the Newcastle-Glencoe road junction, no doubt looking for a way to get around the Boer position and into their laager located behind Intintanyoni. Meanwhile, Maurice (1906), describes the actions of the 5th (Irish) Lancers: ‘Pushing rapidly across the Modderspruit, a squadron of 5th Lancers, supported by two others, drove back at the gallop the small parties of Boers hovering in that neighbourhood and themselves ceased and held this advanced position. The remainder of the cavalry, stringing out along high ground, dominated the western bank of the spruit, and facing more to the [east], formed a strong flank guard towards Jononas Kop’. 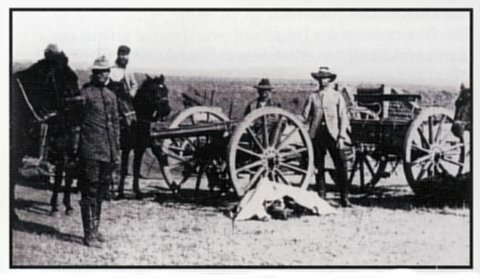 Many of the contemporary accounts seem to suggest that the Boer artillery came into action against the main column sometime later, but a number of shots were fired at the Imperial Cavalry. Captain Walter Temple-Willcox (1981, p222), with the 5th Lancers, writes that ‘the left flanking patrols of the Regiment came in contact with the Boer outpost on the low span of Intintanyoni’. What is important is that virtually all contemporary accounts have the Boer artillery opening up at 08.00, but Haig (Scott, 2006, p130) writes that, having fired a second shell, ‘[t]he enemy next turned their fire on our Infantry and guns and column of route’. Breytenbach (Volume I, p 292) also makes this point, stating that ‘the Free State Artillery began firing at [the mounted troops] with their Krupp gun [from 08.00] though they had only fired a few shots when they spotted the main British force and fired on them instead’. 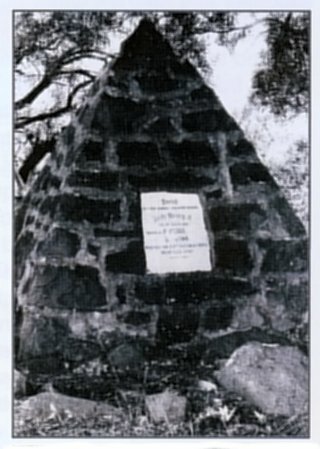 All the sources agree that at approximately 08.00 the Boers opened fire on the main column with their single Krupp 75mm gun at the point where the track leading down to Modderspruit Station meets the main Newcastle road, causing some minor upset amongst the 42nd Battery RFA and wounding a Lieutenant Douglas. By all accounts, the Boer gunners shot well but did not prime their fuses correctly as later rounds failed to explode. The entire British column went to ground as the two field batteries, pausing only to cut the wire fences protecting the railway line, galloped across the level crossing and took up position in the adjacent field. Within minutes the twelve guns of the two batteries had silenced the Boers. While this exchange of artillery fire occurred, the men of the Liverpool Regiment, concealed behind the railway embankment just beyond Modderspruit Station, and the Gloucestershires, hidden in dead ground behind them, received orders to advance across the open veld and form a firing line up on Rietfontein Ridge, the Gloucestershire Regiment to the left and the Liverpool Regiment to the right (see Map 2). Map 2: The situation at Rietfontein, 08.30 on 24 October 1899 The Devonshire Regiment was in reserve, with the 42nd and 53rd batteries covering the move. The 10th Mountain Battery then proceeded up to Rietfontein Range under the cover of the RFA batteries, who joined them once they had assembled their guns and were ready to fire. Captain H W Thwaites (1983, p39) of the 53rd Battery recalls ‘walking into action over the boulders for about a quarter of a mile under a heavy rifle fire from the Boer infantry distant between fourteen and fifteen hundred yards, came into action – 53rd Battery on the right, No 10 Mountain Battery in the centre and the 42nd on the left. The Devons, still in reserve, were first moved to the reserve slope of the ridge and thence four companies to the ridge itself where they took up positions on the extreme left. These positions with one minor alteration, were maintained throughout the rest of the battle’. It is unknown exactly when the Boers took up piquet duty at Rietfontein Farmhouse, but it seems likely to have been on or about 23 October, simultaneously with the occupation of the hills around the area. Joubert had recognised the farm’s tactical importance, being just outside artillery range of the Ladysmith Garrison. There were small groups of Boers patrolling and piqueting around the area as reported by Chorley-Burton (personal diary in the Siege Museum, Ladysmith). The half-battalion of the 2nd Bn King’s Royal Rifle Corps were moved into the reserve once the Devonshire Regiment were called up to the firing line. Sensing some danger from his left flank and keen not to have his communications with Ladysmith compromised, Sir George White gave orders to move the Natal Volunteers from their position adjacent to Modderspruit Station across the railway line, once again cutting wire fences, and to move in the direction of the Rietfontein Farmhouse. The timing of this move is not given, but Trooper D Shaw, Natal Carbineers (personal diary in the Siege Museum, Ladysmith), mentions that, as the Volunteers passed under the two railway culverts on their way to the main farmhouse, they could hear (and no doubt see) the two field batteries blazing away at the Boers, two hundred yards (182m) further up the line, giving the time about 08.45. The Boers in and around the farmhouse were the piquets and patrols sent down from the various commandos positioned on Intintanyoni and Nodashwana. Watkins-Pitchford was amongst the Volunteers and comments (Stirling, 1907, pp27-8): ‘Reaching the other side of the line we trotted across a short mile of open country through a farm belonging to Pepworth (Rietfontein). Then as we came round the farm house we came into the enemies’ fire, and the Colonel (Royston) gave the order to quicken the pace’. (See Map 3). 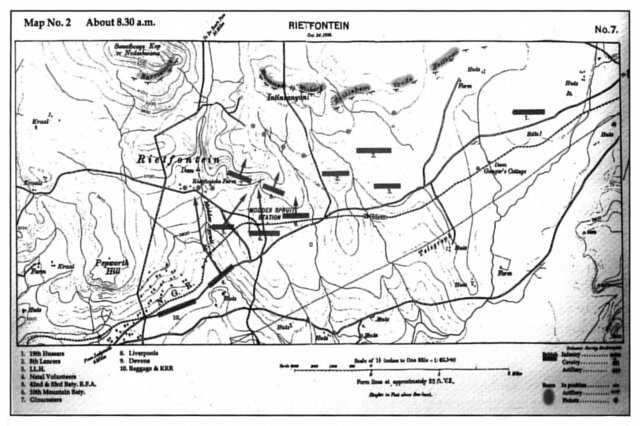 Map 3: The situation at Rietfontein, 10.00 on 24 October 1899 The ground behind and to the north of the farmhouse rises gently for about 800 yards (730m) and then falls off suddenly by about 60 feet (18m), giving a natural crest line which was occupied by the BMR while the NC and NPFF took up position in the region of Mr Pepworth’s newly built dam some 500 yards (457m) to the east. The NMR seem to have been held in reserve somewhere in the region of the farmhouse. The action of the Natal Volunteers, who were on the left of the battlefield, is one of the unsung events of the battle. The official accounts only mention the action in passing, but, as will be seen, it was the bravery and the courage of the colonial solders that ultimately caused the Boers to withdraw. 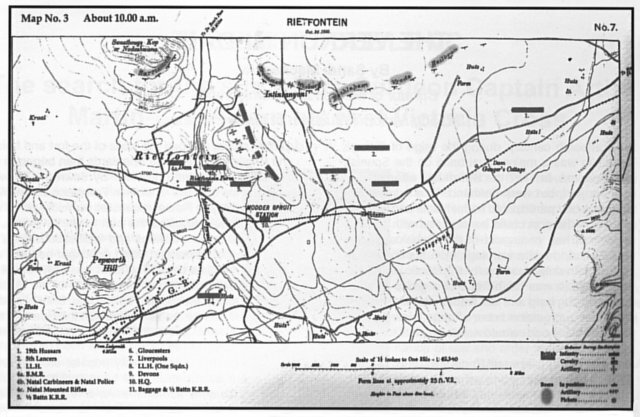 There is no definitive account of the early disposition of the individual units on the left, but, rather, reference to a number of contemporary maps, coupled with eyewitness accounts and the existence of a stone cairn where troopers P Nilsen and S Brown were killed, strongly suggests that the BMR formed the left of the line. There also exists a small, hand-drawn map that Trooper Shaw drew in his notebook later from memory. The Gloucesters are seen advancing up to Rietfontein Ridge with artillery still in the open ground across from Modderspruit Station, supporting the Gloucesters’ advance. This would suggest a time of about 09.30, when the Natal Volunteers had crossed from the right of the battlefield to the left and taken up position so as to protect the left flank. Trooper Shaw places the Carbineers’ horses to the east of the farmhouse. The 220 or so troopers of the Natal Mounted Rifles, under the command of Major R W Evans, seem to have remained in the reserve for the time being, close to the main building. of the BMR killed during the battle of Rietfontein The piquets sent down from the Harrismith Commando’s posts on the lower slopes of Nodashwana must have been driven back on their original position, and a protracted fire-fight then ensued which lasted until about 10.00. Shaw’s ‘from memory’ map (Stirling, 1906, pp27-8) gives the composition of the assault group that was to attack the Boers on Intintanyoni, namely: ‘2.5 Squadron NC, 1 Squad BMR, NPFF’. Using information provided by Stirling, it is possible to make rough calculations of the numbers involved: With an establishment of 136 men per squadron, there would have been about 340 Natal Carbineers, 136 Border Mounted Rifles and, at a pure guess, about fifty Natal Police, giving a force of about 526 effectives along with two Maxim guns. Major Taunton led the Carbineers and Major Sangmeister the BMR. Sometime before 11.00, ‘D’ Squadron ILH, not having much to do, made their way up from the railway line and slotted in between the Gloucestershire and the Liverpool regiments. The reason is not known, but perhaps they wanted to get in on the fight. Directly behind the infantry on the ridge, and somewhat to the left was the artillery, initially 42nd Battery RFA on the left, the 10th Mountain Battery in the centre and 53rd Battery RFA on the right. Sometime around 11.00 a curious incident occurred that remains unexplained: Lt A H Radice of the Gloucestershire Regiment mentions that when Captain B O Fyffe, commanding ‘C’ Company, returned from receiving orders from Colonel E P Wilford, ‘[t]he orders were not clear, or were misunderstood’. 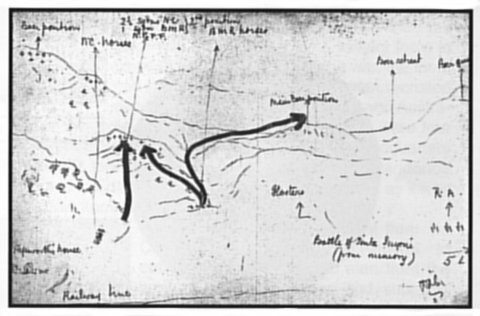 In any event, according to Radice, ‘C’ Company, supported by ‘D’ Squadron ILH, plus the Maxim team, advanced into the valley below the ridge, believing they were to take Intintanyoni and the Boer laager beyond. Radice writes: ‘The men behaved splendidly, advancing without the slightest hesitation although it was the first time they had been under fire’. Someone with the HQ Staff noted the advance and a staff officer was sent galloping to stop the battalion. 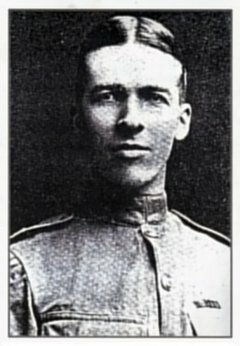 The commanding officer, Lt Col Wilford, could not be located, being up on the firing line, but a bugler from one of the rear companies was sent up with a message to stop the advance. As a result of this error, 47 NCOs and other ranks were wounded and another fourteen were killed in the action or died later of wounds. One can only imagine that ‘C’ Company, Gloucestershire Regiment, had ceased to exist as a fighting unit and, as events would show, this was only the beginning of the Gloucesters’ misfortune. Oddly enough not a single member of ‘C’ Squadron ILH nor the accompanying Maxim team was killed, let alone wounded. To be continued. Part Two and the bibliography will appear in MHJ Vol 15 No 6, December 2012. J & S Franklin Ltd.
TARPULIN – Ingeniería de Protección Ltda. Equipos Móviles de Campaña ARPA S.A.U. DORCE Prefabricated Building & Construction Industry Trade INC.
BEI Precision Systems & Space Company Inc.
Fabryka Broni “Lucznik” – Radom Sp. z o.o. Taiwan Carbon Technology Co. Ltd.
ATV (All Terrain Vehicle) Corp.